This is a beautiful, expertly made platinum band set with 15 round diamonds, .52ct t.w. 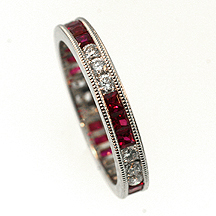 and 15 square rubies, .94ct t.w. This precision crafted band will last a lifetime! $2995, please call for this item!